Thank you for your interest and participation in UW Project ECHO. We house all of our session materials and recordings on a database called WyoLearn. In order to access the database, you will need to create a WyoLearn account. Instructions for joining WyoLearn are below. 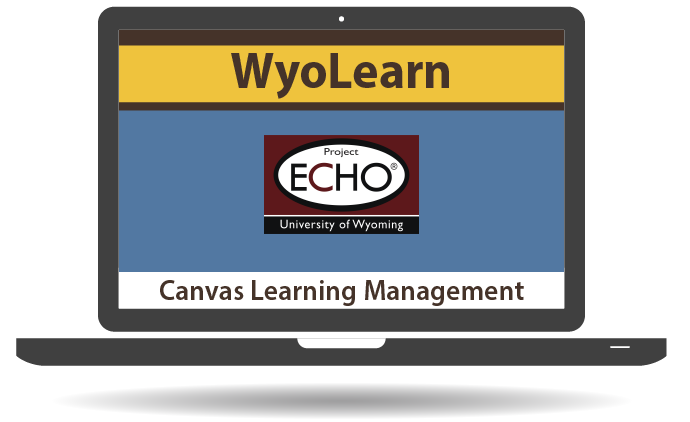 UW’s Canvas Learning Management System! the first time you access a network in WyoLearn. Follow these steps to create your account. Select an ECHO Network you would like to attend. You’ll be prompted to create an account the first time you select “enroll” in any of the network courses. Fill in your name, email, job title and agency or organization, agree to the terms and select “Enroll in Course”. Two emails will be sent to you, a registration email and an enrollment email. You will need to open the registration email to continue. Using the registration email, you will set up a password. Your username will be the email you provided upon enrollment. You will be asked to create a password to access the WyoLearn Courses. Be sure to use one you can remember. You will automatically be logged in. Once you select the course you are attending, you will be taken to the course landing page. Using the “Begin Course” button, you will arrive at the welcome page where you will be able to access the course you signed up for. but you need to enroll to receive access. Click here for a step-by-step guide for creating a WyoLearn account.